Life hasn’t been easy for Quinn Ohlsen. There are the weekly trips to the doctor’s office. The daily medications. And once the 17-year-old gets to school, it’s off to speech and physical therapy sessions. 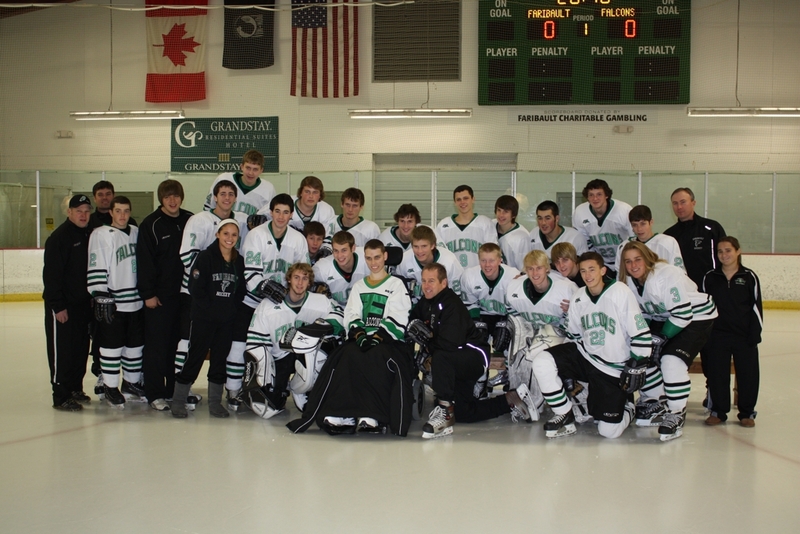 But when Quinn gets to hang out with the Faribault High School boys hockey team, there’s a sense of normalcy. He’s one of the guys. Ohlsen said doctors refer her son as a “medical conundrum.” Quinn doesn’t have one condition, but rather a mix of many. As an infant and young child, his seizures were so bad that his mother feared he wouldn’t survive them. On top of a seizure disorder, he has Tourette Syndrome, IgA immune deficiency and is susceptible to getting sick. As a result of all his medical issues, Quinn is developmentally delayed. Until a few years ago, he was active, said his mother. He would run around and throw the football. “When his body was so active, I called him my car without a driver,” Ohlsen said. But between the end of 2008 to early 2009, Quinn’s health deteriorated to the point where he became a quadriplegic. He’s now confined to a wheelchair, with no control of his body from the waist down and limited ability with his hands. None of that has changed Quinn’s outlook on life — or his passion for sports. Two years ago, FHS boys hockey coach Brad Ryan, a physical education teacher, met Ohlsen in one of his adaptive physical education classes. Instantly, the two formed a bond. While Ryan and Quinn bonded at school, it would turn out they had something else in common: Hockey. Ryan invited his students to come watch a Falcons game. After Quinn attended his first game last season, he was hooked, going to as many as he could. What draws Quinn to the sport, his mom said, isn’t the scoring or the checking. It’s the things that the rest of the fans at Faribault Ice Arena take for granted. The sound of the skates scraping on the ice. The banners hanging from the rafters. The cool temperatures emanating from the rink. Such was the case earlier this year, when Quinn was invited onto the ice after the Falcons took their team picture. As his wheelchair was pushed out onto the rink, the players joined him. His interaction with the team at games and practices has led to many friendships. At school, members of the hockey team will see Quinn in the hallway and give him a high five or stop to say hello. Before a game last season, Quinn had the honor of joining the Falcons in the locker room before the opening faceoff. He made a pre-game speech, and although it was brief — his right vocal cord is paralyzed — it meant a lot to the team. Indeed, sharing a bond with Quinn has made the Falcons realize how fortunate they are to be able to lace up their skates and take the ice in front of their fans. It’s something Quinn will never have the chance to do. Quinn continues to receive medical treatments. In July of 2009, he began taking L-dopa — common among patients with Parkinson’s disease — which his mother said has slowed down the progression of her son’s condition. Because his condition is so rare, however, doctors don’t have a firm idea of what Quinn’s long-term prognosis is. Yet he continues to make his way to the ice arena to support his Falcons. After all, he’s one of them. — Sports reporter Tyler Mason may be reached at 333-3119. After falling behind 3-0 in the first period, the Faribault High School boys hockey team couldn’t battle back Saturday against Breck, falling 6-0 at the Faribault Ice Arena. Wesley Iverson put the Mustangs on the board 3:45 into the contest, and Thomas Lindstrom and Grant Opperman both added first-period goals. Faribault’s best chance to climb back into the game came in the second period, when Breck was assessed a five-minute major penalty. But the Falcons (9-13-1) came up empty on the power play and Breck closed out the period with a 4-0 lead. Instead, Andrew Headrick made it 5-0 at the 12:28 mark of the third and Iverson added his second less than a minute later. Breck (15-8) fired 51 shots on FHS senior goaltender Aaron Forgaard, who made 45 saves. Jack Kenney pitched the shutout in net for the Mustangs, stopping all 19 Falcons shots he faced. ROCHESTER — Sean Lipinski scored twice and Jack Helgeson added a goal as the Faribault High School captains lifted the Falcons boys hockey team to a 3-1 win over Rochester Century on Thursday. Helgeson opened the scoring, netting a goal 13:24 into the first period. Lipinski had the first assist, which would be the first of his three points on the night. Later in the first, Lipinski scored short-handed to give FHS (9-12-1, 6-3 Big 9 Conference) a 2-0 lead after one period. Century’s Brandon Kautz took advantage of a Falcons penalty to cut the Faribault lead to 2-1 on a power play goal at the 11:07 mark of the second period. But Lipinski scored late in the third to eliminate any doubt of the final outcome. Falcons senior goalie Aaron Forgaard was tested Thursday, as he the Panthers (9-12, 6-4) fired 41 shots on goal. Forgaard made 40 saves for the win. Next up for FHS is a home game Saturday against Breck. Face-off is set for 7:30 at Faribault Ice Arena.